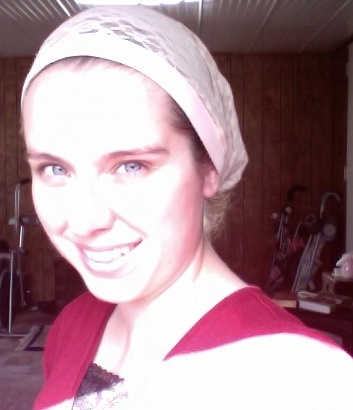 Someday I'll Sleep Autism Blogs: Headcovering: A Requirement? Back when I first threw my hat into the ring in the headcovering debate, I am embarrassed to admit that I took a hard line. It was a very reactive stance. I would see online debates on headcovering and for the most of part, those of us who did cover our heads were outnumbered. We’d be called proud and hateful and the knee jerk reaction was to prove that we were right. Proving that one is right doesn’t always bring out the most charitable response, and unfortunately that was the case for both sides in many of these debates. Fast forward to the present. I’ve been covering since Sadie was born (that was the deadline I set for myself after about a year of thinking about it because I was so nervous about what others would think…), which means it’s been a little over two and a half years. I no longer give much thought to what others think when I walk in with a hat or a snood or a chapel veil, because my hands are, quite literally, full with a toddler and an infant who both think that they should be sitting on Mommy’s lap and are ready to fight it out for that prized seat. I first became interested in headcovering after I heard the story of how it ended as a requirement. Many of us already know the story. Here it is in a nutshell: A prelate, usually identified as Annibale Bugnini, emerges from the second Vatican Council to a crowd of reporters. A female reporter in the crowd asks him what they’ve decided about headcovering in the Church. He replies that they didn’t even speak of it. 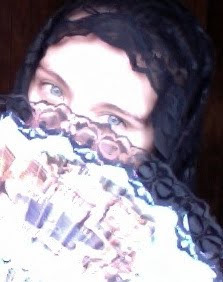 She runs the story that the Church no longer requires women to veil. It’s really yet another example of the media misunderstanding a Church officials statement. And in the aftermath of the lie, women stop wearing their veils. Fast forward a couple decades: When the 1983 Code of Canon law came out it didn’t mention headcovering. Now there’s much debate over what this means. I’ve heard good arguments on both sides. I tend to accept that it’s no longer required, because I do believe it’s an issue that shouldn’t be forced (more on that when I explain why I cover). If I hadn’t felt called to cover I imagine that I would have resented being made to wear something (at least I would have early on in my conversion) and it could have easily become an obstacle rather than an aid during Mass. "But it must be noted that these ordinances, probably inspired by the customs of the period, concern scarcely more than disciplinary practices of minor importance, such as the obligation imposed upon women to wear a veil on their head (1 Cor 11:2-16); such requirements no longer have a normative value. However, the Apostle's forbidding of women to speak in the assemblies (1 Cor 14:34-35; 1 Ti, 2:12) is of a different nature, and exegetes define its meaning in this way: Paul in no way opposes the right, which he elsewhere recognizes as possessed by women, to prophesy in the assembly (1 Cor 11:15); the prohibition solely concerns the official function of teaching in the Christian assembly. For Saint Paul this prescription is bound up with the divine plan of creation (1 Cor 11:7; Gen 2:18-24): it would be difficult to see in it the expression of a cultural fact. Nor should it be forgotten that we owe to Saint Paul one of the most vigorous texts in the New Testament on the fundamental equality of men and women, as children of God in Christ (Gal 3:28). Therefore there is no reason for accusing him of prejudices against women, when we note the trust that he shows towards them and the collaboration that he asks of them in his apostolate." I actually included a little more of this text than was necessary because I thought the entire paragraph contained pretty important information. But to avoid getting too sidetracked I’ll continue with my observations and research on headcovering. 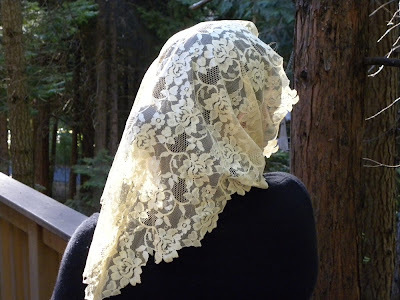 I think one of the reasons I was pleased to find a document explaining that headcovering is optional is that I would hate to see it as a stumbling block to anyone considering coming home to the Church and I know that it very well could be. To avoid writing an extremely long post on this subject I’m going to break up this post by topic. You’ve just finished the first post: Headcovering: A Requirement? And the answer that I believe is true is that it is not. It’s beautiful and lovely and it has added to my life immensely. For that reason I would enthusiastically recommend it to anyone. But it is not required. And no one should be made to feel guilty for following their conscience on this particular issue. Quite simply the Church has not taught that it is required in our time. So it’s not. Now that we’ve talked a little about what headcovering isn’t, I’d like to take a look at what it is and why women, myself included, cover (although I have a feeling I’ll address some of the myths tossed around about headcovering in another post!). Is it a little crazy that I spent so much time explaining how something that I think is wonderful isn't required? Maybe it is. But now we can look at how, while it isn't required, it is still wonderful. For a follow up post you may like: Headcovering: If It's Not Required Why Cover or any of the other posts under the Headcovering label (where I've written pages and pages about the subject over the years...). I'm glad you enjoy this custom and feel good about it. I know that just because it's not for me, doesn't mean it's not for you. It seems like you feel the same. If we look at it another way - there are lots of very involved, devout, lovely women at our parish. Some wear crucifixes around their necks, while others wear either nothing or a non-religious necklace. The women who wear crucifixes are not better or more holy than the women who don't. They aren't trying to be smug or controversial. It's just their preference. The ladies without crucifixes might very well be closer to sainthood than the others - who knows? Lord knows it's what's in our hearts and our actions that count, not what we wear. No one accuses crucifix-wearers of being "holier than thou" or desperate for attention, stirring the pot, etc. I see your headcoverings in the same way. Wear them, or don't. It's your call and your business!